The Redwood Theatre in Toronto’s Lower East Side, formerly known as the Centre of Gravity, has already made a mark on the local theatre scene by hosting sharply entertaining and one-of-a-kind performing arts events. That said, the giant inflatable Stay Puft Marshmallow Man out front for the performance of Ghostbusters: The Movie Experience helps too. 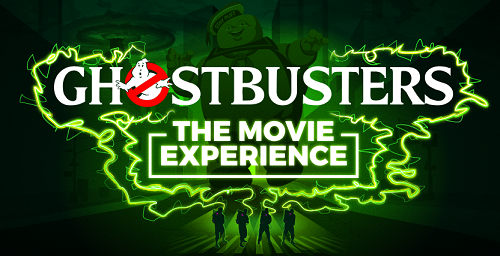 The Secret Sessions is a local company that specializes in immersive reenactments of classic films, and their latest show is a romp through the 80’s classic, Ghostbusters. The format is similar to the shadowcast phenomena first popularized by fans of the Rocky Horror Picture Show in the mid-to-late 1970’s, in which a live cast perform a film, including props, costumes, and audience participation, whilst the film is screened simultaneously. Going into this show, I was expecting a similar format and ended up being shocked in the best way possible at how this company enhanced the immersion and excitement factor of this strange breed of performance. Curiously, the time listed on the ticket was when doors opened, rather than when the performance began, but as we entered the theatre, the reason why was immediate. Classic 1980’s tunes wafted from the sound system, with the cast mingling about and greeting guests in-character. The floor and stage were all part of one big set made to look like various places in 1980’s New York, with pieces like desks, maps and ghost-busting equipment set up in every corner. My guest and I walked past the bar, serving Ghostbusters themed cocktails and New York-style hot dogs with ecto-green Rice Crispie Squares. I would have preferred Twinkies, but the marshmallows and green food colouring also work with the theme. As we entered the floor space, a man grinned at us and opened his arms. His beige jumpsuit had the name VENKMAN on the chest. “Welcome, folks!” he said with a cocky, loud swagger. I smiled back, thanking him. Silently, I started pondering my dilemma. As a reviewer, I’m meant to be impartial and engage with a critical eye, aren’t I? How do I stay professional while still honouring the commitment and immersion put into this production? Peter Venkman (Will Conlon) encouraged us to take a look around, directing us to say hello to his secretary Janine (Katherine Cappellacci) to see if we could lift her spirits. As we approached her desk, she looked up from her stack of paperwork with chagrin, welcoming us in a damning impersonation of the nasally Brooklyn voice that greets customers of the Ghostbusters. I couldn’t resist. “They don’t pay you enough, do they?” I asked. This got a big, relieved reaction out of her. For the half-hour before the show began, audiences got to mingle with the characters from the film. Guests who believe they’d seen supernatural occurrences were welcomed to get a consultation from one of the experts. After a bit of wandering, we got beckoned by Egon Spengler (Sean C. Dwyer) to his pop-up science station. Here, we inspect samples of ghost slime and create our own to take home. Guests with the courage could also get into an awkward dance-off with Louis Tully (Jonathan Sconza). It’s theatre in the same way that going to a theme park and seeing actors playing princesses and superheroes is, which is by no means a bad thing. Breaking the boundaries of traditional performance is not only an innovative way to approach theatre and inspire greater creativity from artists, it’s also extremely fun. Once the show started, I was eager to see how they would approach some of the iconic scenes and recreate the ambitious effects the film is known for. Rather than playing the film start-to-finish with the cast imitating the events in front of a screen, the show is a blend of scenes being acted out with some shots and scenes from the film played to enhance the setting. Given how interactive the preshow was, I was hoping to see more of the live cast on stage, especially with the appearance of stunning screen-accurate props by the Ontario Ghostbusters. Understandably, some of the effects can’t be feasibly done live without the budget or resources of Cirque du Soleil. The ghosts and creatures that we do see ‘for real’ are wisely played for laughs. In some cases, this makes many of the famous scenes even funnier, such as the gang chasing Slimer (who appears to have taken up interpretive dance in this version of events) through the hotel. I enjoyed the fresh take the cast had on their characters, bringing their own quirks, sense of humour and comic timing to their delivery. Still, I found myself wanting to see more of the live cast, particularly with scenes like Venkman and Dana’s banter, or the film’s final post-victory scene. The group’s commitment to an immersive experience was so strong, I just wish they’d seen it through the whole show. The caveat is that people who are fans of the films being performed are more likely to get the most out of the experience. That said, this show is a blast, and this company found a niche that entertains while pushing creative boundaries. Doors open at 7pm, and close after 15 minutes.